John Lackey is denied his 150th career win as Tampa Bay improves its streak to nine victories. 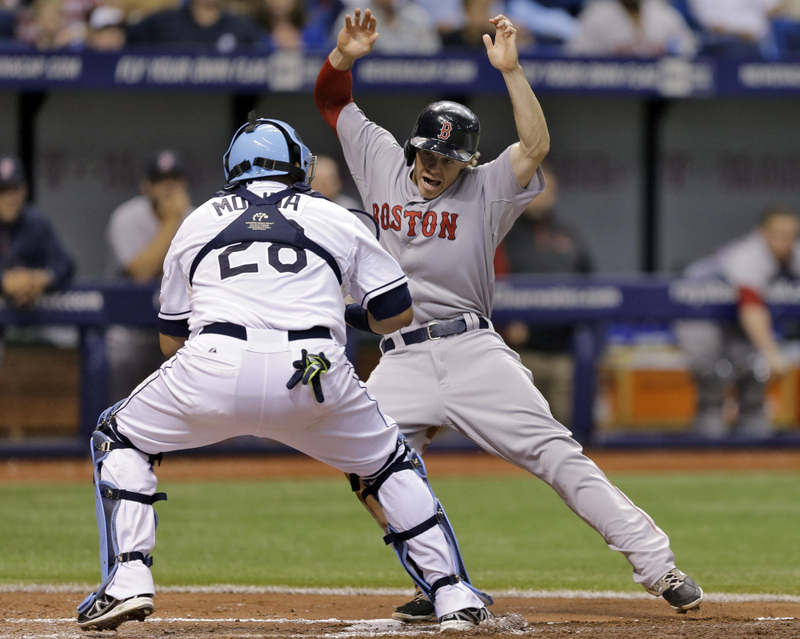 ST. PETERSBURG, Fla. – Ben Zobrist homered, Matt Joyce and Kevin Kiermaier each had an RBI single, and the Tampa Bay Rays beat the skidding Boston Red Sox 3-0 Saturday night for their ninth consecutive victory. The stretch is the second-longest in team history, three short of a 12-game winning streak in June 2004. John Lackey (11-7) came up short in his first attempt to earn his 150th win, giving up three runs and eight hits over seven innings. Before the game, the Red Sox traded right-hander Jake Peavy and cash to San Francisco for minor league pitchers Edwin Escobar and Heath Hembree. Boston, last in the AL East one season after winning the World Series, has lost five straight. The non-waiver trade deadline is Thursday. Zobrist made it 3-0 with his seventh-inning shot. Grant Balfour (1-3) went 1 2-3 innings for the win, and Jake McGee pitched the ninth for his 11th save. Jeremy Hellickson, coming back from right elbow surgery and making his second start this season, gave up five hits over 4 2-3 innings. Jeff Beliveau replaced Hellickson with a runner on and retired David Ortiz on a hard liner to first. Desmond Jennings had a bunt single in the first inning and advanced to third on catcher Christian Vazquez’s errant throw. Boston manager John Farrell appeared to argue with plate umpire Chad Fairchild about Jennings’ route to first, but the call stood. Jennings scored on Joyce’s single. Kiermaier’s run-scoring single in the fourth came right after Yunel Escobar was almost picked off second base, a close play Farrell decided not to challenge. Ortiz was given a double in the first after a fan caught his drive near the yellow home run line at the top of the right-field fence. The call stood after a boundary area video review. Ortiz was left stranded when Mike Napoli struck out. Brock Holt was thrown out trying to score from second to complete an inning-ending double play in the third after Ortiz was retired on a grounder into shallow right field. The Red Sox also failed to score after putting runners on first and third with none out in the sixth. Balfour got the final two outs of the inning. NOTES: RHP Alan Webster will come up from Triple-A Pawtucket to replace Peavy as Sunday’s starter. The Rays’ starter is RHP Chris Archer. … Tampa Bay reliever Joel Peralta (illness) threw a scoreless inning for Class-A Charlotte and could return Monday.